They may not get quite as many letters as the North Pole this time of year, but the First Family certainly receives its fair share. 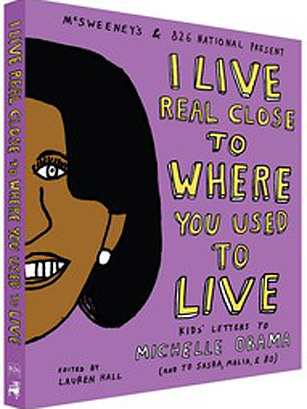 Some of the most entertaining have ended up in I Live Real Close to Where You Used to Live (McSweeney's), a compilation of kids' letters and hand-drawn illustrations addressed to the First Lady and her children. While her husband is more accustomed to fielding questions about the economy and foreign policy, the letters to Mrs. Obama fall more into the category of personal favors: playdates with her daughters, "sustainable" fashion and $10,000 to buy a passport to go to Las Vegas. Even if not all the requests here fall in line with the holiday spirit, the book itself does  all proceeds go to 826 National, a family of nonprofit groups that support writing workshops for kids.